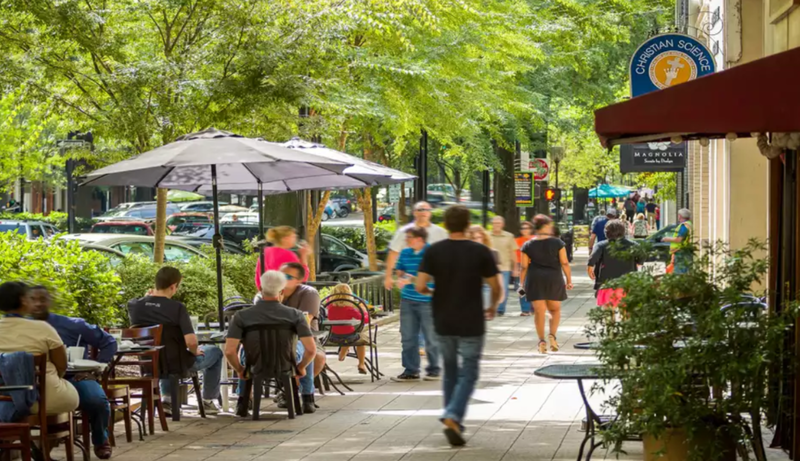 Greenville, South Carolina is a peer city that we are modeling from for Elkhart. The population has grown to be 90,000, from just 50,000 in 1990. Their streets and parks are renowned attractions as a smaller USA city. The River District is designed to be an urban residential extension of downtown Elkhart. That means that people must feel welcome and safe to live there. It will not be traveled as a truck route and it will not be a highway or state route. It will be traveled at 20 mph - not 40 mph. 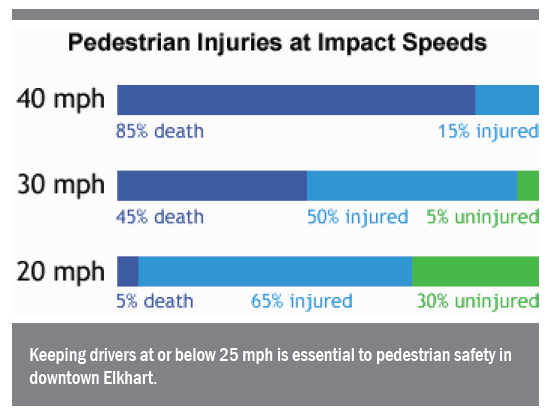 Per the chart below, note that creating a welcoming and safe walkable environment begins with well-planned traffic control. Traffic studies support that Jackson Boulevard traffic mostly splits to north and south bound routes at Johnson/Prairie -- leaving only 9,000 cars per day traveling on Jackson between Main Street and Johnson/Prairie Street. Near-term intersection improvements at Jackson/Johnson (two westbound lanes on Jackson will turn north on Johnson starting October 2019) will help better transition traffic to their north/south destinations: primarily leading traffic to Middlebury and Cassopolis. The following article is an excerpt written by our urban planner, Jeff Speck, and it clearly highlights the facts supporting narrower lanes as stated by U.S. safety and transportation agencies. Bottom line: Just because we may be conditioned to travel faster on wider lanes -- doesn't make it right, safe, and suitable to where people live. A little background: First, we are talking only about high-volume streets here. Neighborhood streets can have much narrower lanes. The classic American residential street has a 12-foot lane that handles traffic in two directions. And many busy streets in my hometown of Washington, D.C., have eight-foot lanes that function wonderfully. These are as safe and efficient as they are illegal in most of the United States, and we New Urbanists have written about them plenty before, and built more than a few. But what concerns us here are downtown streets, suburban arterials and collectors, and those other streets that are expected to handle a good amount of traffic, and are thus subject to the mandate of free flow. Second, you should know that these streets used to be made up of 10-foot lanes. Many of them still exist, especially in older cities, where there is no room for anything larger. The success of these streets has had little impact on the traffic-engineering establishment, which, over the decades, has pushed the standard upward, almost nationwide, first to 11 feet, and then to 12. Now, in almost every place I work, I find that certain streets are held to a 12-foot standard, if not by the city, then by a state or a county department of transportation. States and counties believe that wider lanes are safer. And in this belief, they are "dead" wrong. In some cases, a state or county controls only a small number of downtown streets. In other cases, they control them all. In a typical city, like Cedar Rapids or Fort Lauderdale, the most important street or streets downtown are owned by the state. In Boise, every single downtown street is owned by the Ada County Highway District, an organization that, if it won't relinquish its streets to the city, should at least feel obliged to change its name. And states and counties almost always apply a 12-foot standard. They are wrong because of a fundamental error that underlies the practice of traffic engineering—and many other disciplines—an outright refusal to acknowledge that human behavior is impacted by its environment. This error applies to traffic planning, as state DOTs widen highways to reduce congestion, in complete ignorance of all the data proving that new lanes will be clogged by the new drivers that they invite. And it applies to safety planning, as traffic engineers, designing for the drunk who's texting at midnight, widen our city streets so that the things that drivers might hit are further away. The logic is simple enough, and makes reasonable sense when applied to the design of high-speed roads. Think about your behavior when you enter a highway. If you are like me, you take note of the posted speed limit, set your cruise control for 5 m.p.h. above that limit, and you're good to go. We do this because we know that we will encounter a consistent environment free of impediments to high-speed travel. Traffic engineers know that we will behave this way, and that is why they design highways for speeds well above their posted speed limits. Unfortunately, trained to expect this sort of behavior, highway engineers apply the same logic to the design of city streets, where people behave in an entirely different way. On city streets, most drivers ignore posted speed limits, and instead drive the speed at which they feel safe. That speed is set by the cues provided by the environment. Are there other cars near me? Is an intersection approaching? Can I see around that corner? Are there trees and buildings near the road? Are there people walking or biking nearby? And: How wide is my lane? When lanes are built too wide, pedestrians are forced to walk further across streets on which cars are moving too fast and bikes don't fit. All of these factors matter, and others, too. The simplest one to discuss, and probably the most impactful, is lane width. When lanes are built too wide, many bad things happen. In a sentence: pedestrians are forced to walk further across streets on which cars are moving too fast and bikes don't fit. 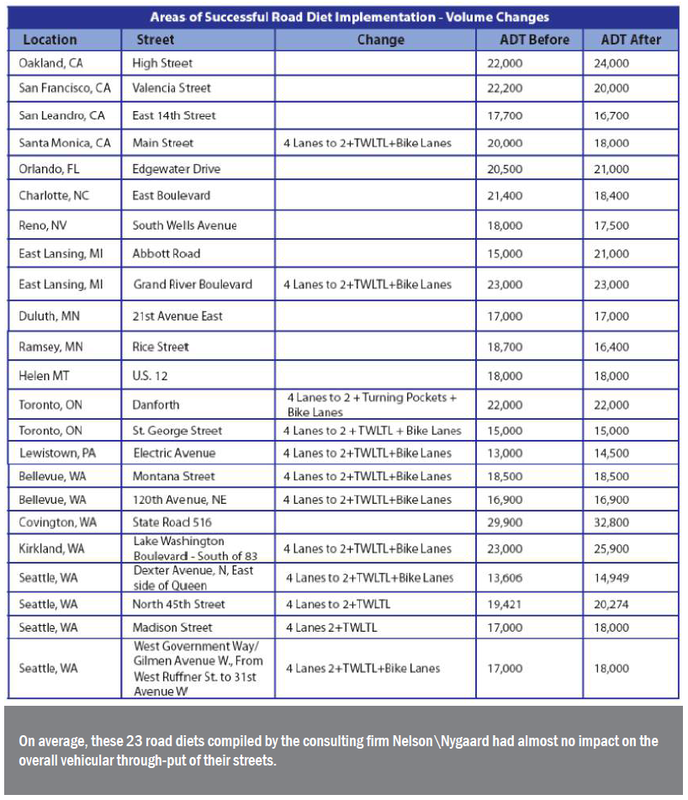 The following paragraphs lay out the evidence against 12-foot lanes, evidence compiled by traffic engineers, for traffic engineers. First, we will investigate what the American Association of State Highway and Transportation Officials Green Book, the traffic engineers' bible, has to say on the subject. Then we will review the very few studies that compare crash statistics and driver speeds on lanes of different widths. These will allow us to draw some clear conclusions about safety. For traffic engineers, AASHTO is the keeper of the flame. Its "Green Book," the Policy on Geometric Design of Highways and Streets, is the primary source for determining whether a road design is an accepted practice. As such, it is useful in protecting engineers against lawsuits; if something is in the Green Book, it's "safe." Here, the takeaway is clear: AASHTO says that 10-foot lanes are just fine—for what it's worth. A number of studies have been completed that blame wider lanes for an epidemic of vehicular carnage. One of them, presented by Rutgers professor Robert Noland at the 80th annual meeting of the Transportation Research Board, determined that increased lane widths could be blamed for approximately 900 additional traffic fatalities per year. Unfortunately, Noland is a mere Ph.D. and not a practicing engineer. His evidence apparently didn't mean squat to the TRB. If you don't have short-sleeved white shirt and a pocket protector, you may as well stay home. Before finishing, we need to investigate the carrying capacity of different width lanes, since traffic volume remains a legitimate concern. If safety were the only goal of traffic planning, all streets would be one-lane wide—or better yet, zero lanes wide. The fact that they are not means that we, as a society, are more than willing to sacrifice lives for automobility. So, what's the data? Alarmed by its horrifying safety ranking—and the barrage of resulting bad publicity—FDOT has taken bold measures to improve pedestrian safety. It released just last year a 44-page Florida Pedestrian and Bicycle Strategic Safety Plan. Unfortunately, while this document talks plenty about such things as driver, cyclist, and pedestrian education, only two of its pages deal remotely with the real culprit, traffic engineering. Here, we are told that FDOT intends to "implement pedestrian and bicycle best practices," a phrase that is fairly meaningless without further definition. To its credit, the plan advocates for the application of a "complete streets" policy to benefit cyclists and pedestrians. But such policies, as we have learned, make sure that some streets include bike lanes and sidewalks, but rarely require the dimensional properties that make them safe. Nowhere in the entire Strategic Safety Plan are lane widths discussed, or any other design feature of the roadway that might encourage deadly speeds. In fact, you can learn all you need to know about this effort by glancing at the cover of the report, which is stamped with the project motto: "Alert Today, Alive Tomorrow." Think about that statement, and what it implies. In an encounter between a car and a pedestrian, whose life is at risk? Who, then, is expected to reform her behavior? Certainly not the driver—and most certainly not any engineers who endanger their populations with 12-foot lanes. I believe that FDOT—and every DOT—is capable of reform, but experience suggests that this will only happen when enough people make a stink. In Florida, we will be able to gauge the DOT's willingness to enter the reality-based community by how it responds to a proposal recently made to restripe Okeechobee Boulevard, a deadly state highway that cuts through downtown West Palm Beach. Its nine lanes separate the Palm Beach County Convention Center from everything that conventioneers walk to, and are a nightmare to walk across or beside. These lanes, of course, are 12 feet wide. But will they? Only if they are capable of reform. Let's find out. The agency's bike and pedestrian coordinator, Billy Hattaway, is one of the good ones. But does he have the power to move FDOT to a 10-foot standard? It's time to push this discussion to its logical conclusion. Until conflicting evidence can be mustered, the burden of proof now rests with the DOTs. Until they can document otherwise, every urban 12-foot lane that is not narrowed to 10 feet represents a form of criminal negligence; every injury and death, perhaps avoidable, not avoided—by choice.